Three concerns leave many revenue cycle experts searching for answers. Some would argue that confusion and uncertainty go hand in hand with the Centers for Medicare & Medicaid Services’ (CMS) Recovery Audit Contractor (RAC) program. There are numerous circumstances that baffle revenue cycle and coding leaders, but three issues in particular appear to stand out: Part B billing after Part A denial, outpatient therapy, and transparency. • services where the documentation does not support the ordered services. When it comes to outpatient therapy and Part B billing, many providers are challenged more by how the guidelines and mandates seem to be in a constant state of flux than they are by coding accuracy and documentation to support medical necessity. An example of the vagaries of RAC rules can be seen in CMS Rule 1599, which covers rebilling to Medicare Part B when Part A claims are denied and the controversial two-midnight rule. Under the rebilling provision, in cases where a Part A claim for inpatient services is denied because admission was deemed unreasonable or unnecessary, the CMS will allow payment of all provided services that would have been reasonable and necessary had the patient been treated on an outpatient basis. The exceptions are those services that specifically require an outpatient status, such as emergency department visits and observation services. However, it is the so-called two-midnight rule that Klasa says is causing the most consternation for providers when it comes to RAC rules—enough so that the American Hospital Association, four integrated delivery systems, and four state hospital associations have filed suit in federal court contending that it is arbitrary and capricious. Specifically, Medicare will not reimburse hospitals under Part A for inpatient services if that treatment does not span two midnights because it considers such treatment to be outpatient and therefore payable under Part B.
Klasa notes that as part of the “doc fix” bill, enforcement of the two-midnight rule has been extended from October 2014 through March 2015. Until March 31, 2015, hospital inpatient admissions under the two-midnight rule will be subjected to only a limited number of prepayment claim reviews by Medicare administrative contractors (MACs). Thus, for inpatient claims with admission dates of October 1, 2013, through March 31, 2015, the RACs will not conduct prepayment reviews, and both the RACs and the MACs will not conduct postpayment reviews. Depending on the hospital, auditors will review 10 to 25 claims per facility. “It seems that some of the risk is in the interpretation of the issue and the clinical guidelines. However, it has been proven that most of the confusion is on the RAC side, with the amount of appeals being overturned in favor of providers,” Klasa says, noting that a recent RACTrac report found that 47% of hospital denials are appealed, and nearly 70% of those are overturned. “This extreme backlog of appeals has resulted in a suspension of assignment of at least two years for appeals to the administrative law judge [and] wait times of at least an additional six months before a judge hears an appeal after assignment,” she adds. For example, ClaimsEditor performs both pre- and postpayment reviews to analyze audit risks and edit against not only technical edits but also national and local coverage determination edits, utilization, and National Correct Coding Initiative edits on which most automated RAC issues are based. In the outpatient therapy realm, problems stem largely from a lack of clear communication between RACs and providers. At issue are the reasons behind denials. The effects of poor correspondence are most noticeable during prepayment review. Thresholds include $3,700 for physical therapy and speech language pathology, and a separate $3,700 threshold for occupational therapy. Beckley, whose firm provides compliance consulting, training, and education, notes that the CMS originally assigned manual medical review of therapy claims to MACs in 2012 when the program was initiated then reassigned the task to RACs in April 2013. Each RAC posted manual medical review of therapy claims as approved CMS issues, although each posted differently, Beckley says. Prepayment reviews were to be performed in the 11 CMS RAC prepayment review states, and postpayment reviews were to be conducted in the remaining 39 states. Prepayment reviews were to be conducted within 10 days of receipt of all additional documentation request (ADR) information or the payment was to be made. Beckley agrees with many denials; for example, a claim in which the therapist failed to document properly even though the beneficiary needed the care. However, she says that many providers wonder if their ADR documents are even being read. Because of how little RACs are paid and the amount of time it takes to review a typical 50 to 100 pages of such documentation, RACs often lose money auditing therapy claims. In fact, many in the therapy industry suspect RACs are not actually reading the full documentation. Rather, they are just skimming and denying. • A day of therapy is about $100 in total fee schedule reimbursement for an average visit of one hour. • The ADR to support the claim carries costs for copying and postage, clerical staff labor, and the time it takes for clinical staff to create a cover letter to prove medical necessity. • The RACs process the information and presumably assign a nurse or a therapist to review the documentation, which could be anywhere from 50 to 100 pages either of handwritten or EMR-generated documents. Reeves views the situation differently. She believes the RAC program is highly transparent, citing the Web portals that are used by every integrity contractor to communicate auditing status and results to providers. Prior to an audit, contractors post the issues up for review. 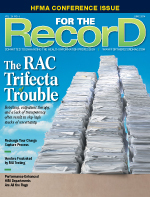 Using the RAC findings as a point of reference, MACs encourage providers to evaluate vulnerable areas and adjust their billing practices accordingly. • a requirement that RACs adjust the ADR limits in accordance with a provider’s denial rate (ie, those with low rates will have lower ADR limits). Hospital financial experts would be thrilled if those results came to fruition because not only would they make the RAC process more transparent, but they also would help erase the pitfalls associated with rebilling and outpatient therapy.